Have several different kinds of wine on hand for tasting. Great reds to try are Cabernet Sauvignon, Merlot, Pinot Noir and Syrah. Whites that you might want to try include Chardonnay. Sauvignon Blanc and Riesling. If your guests are well versed in wine, try wrapping a few bottles with cloth napkins to hide the labels, then have them guess what they are sipping. This wine and cheese pairing chart will be helpful when it comes to shopping for your party. Smaller gourmet food shops, or stores like Trader Joes and Whole Foods will have a great selection of cheeses. Choose one or two cheeses to pair with each type of wine. Buy small amounts of each cheese, as it can be filling. Have plenty of white wine glasses and red wine glasses set out on your table. You'll want to switch glasses when changing from whites to reds. White wines are best to start with, as they are lighter. End your tasting with red wines, as they have a more distinct, rich taste. For fun, add wine charms to tags to glasses to identify which guest they belong to. This way, when a guest sets their glass down while mingling, they'll be able to find it on the table. If you've only invited a small set of guests, consider giving them a bottle of wine as a favor at the end of the evening. Add a wine tag with a note of thanks. 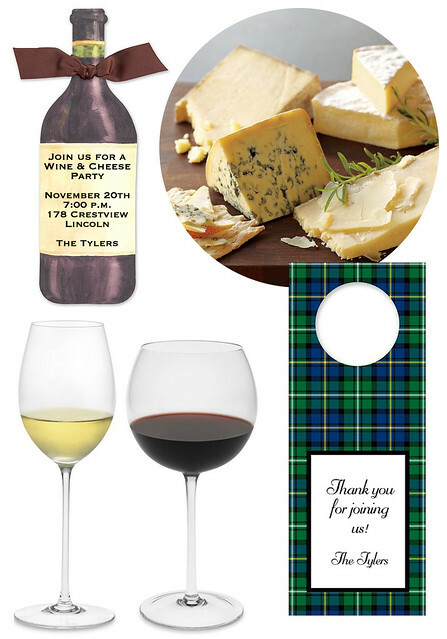 You'll want to choose an invitation that is wine-themed, like the bottle shaped style above by Checkerboard.